Mark your calendars, everyone!! Hang out and chat ... and scrap ... or chat and scrap later - do whatever works for you! A slow scrap is coming this weekend with our NSD celebrations!! Basically, you have 24 hours to complete your layout. Easy-peasy, right? I'll have all the specifics later in the week ... meanwhile, block out some time for a little NSD fun I mean, "chat-n-scrap-with-Kat" has a nice ring to it, don't you agree? At 2:00 pm (ET) tomorrow, I'll be live on our chat room (the link is in the black bar at the top of the page) to talk about ... well, anything you want! NSD, store finds, pages you've created, favorite foods, the weather ... yup, literally, anything! 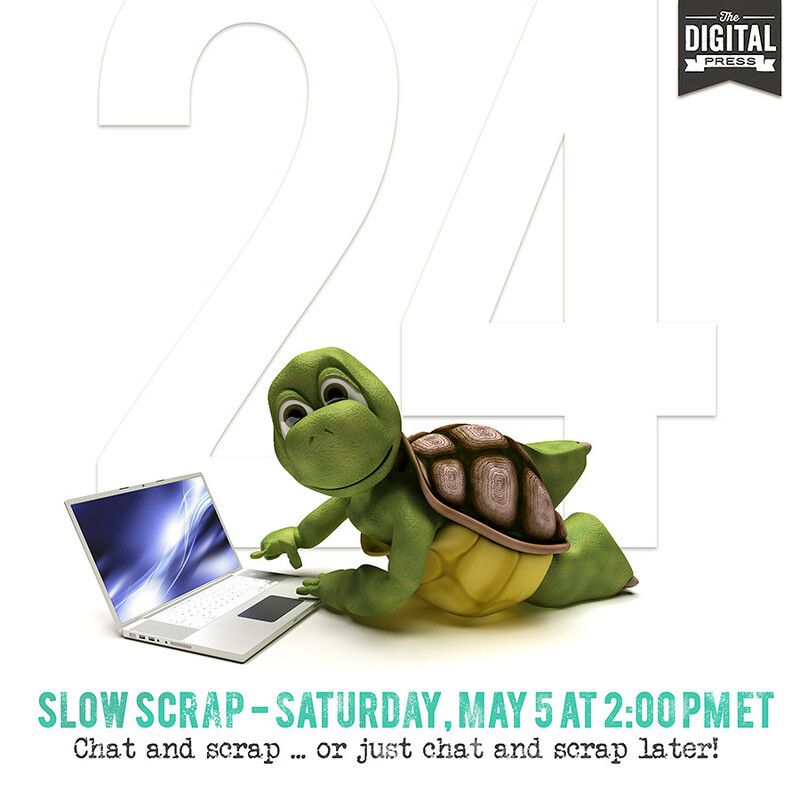 Unlike a "speed" scrap that typically has to be completed in 1-2 hours, a "slow" scrap affords you a full 24 hours, which is perfect for NSD, when you're being pulled in a million different directions, right? That's it. Oh, yeah, and then there's sharing the layout ... prizes ... blah blah blah ... but I'm not saying anything about that last part until tomorrow. Last edited by Kat Hansen; 05-04-2018, 09:22 AM. lol love the image! Will try to be there too. Just need to check if my timezone fits with the chat. Woot Woot! I need scrap time!! And yes! "chat-n-scrap-with-Kat" sounds awesome!! Oh nooooo!!! It's Sunday 3 am!!!! I won't be in the chat but I'll do my best to scrap slow when I wake up! I am not sure I can join at 2pm I'll try my best... yard work for my inlaws. If I can't I'll scrap when I can. Oh fun!! Hope to be home from our baseball game in time!! and that is 7pm London time, so I hope I will be able to swing by and chat-and-maybescrap-with-Kat! Ohhh I love slow scraps Kat!! Thank you!! Okay, if you're just checking in (and what took you so long?!?! ), and you're not sure what this challenge is all about, I added a little more information in the first post. Fun. Hope I can hang out with you Kat. Okay, instructions are all complete - and I really hope that I got them right (for those of you that have been here when I've done speed scraps before, I've been known to get my left and right all mixed up! ) I'll be ready to chat in a few hours. I'm glad we'll have 24 hours to complete the challenge. My mom just called and offered to take me to lunch... how could I pass that up? I'll be back later to see what you have up your sleeve Kat.